They went straight to their mats for a warm Vinyasa flow class taught by Jennifer Hess Mitchell, co-owner of Soul. The class was all-levels and there were mamas doing handstands and others who hadn’t practiced since babes were born and an overall sense of “I came here for sanctuary, not judgment or perfection.” We giggled while we stretched for our neighbor’s foot and supported it. “This is a chatty, bubbly group,” commented Mitchell. Why, yes, of course. We are The Champagne Society. All kinds of women at all kinds of stages who know the power of a BREAK from real life, mom life or careers. After class, we broke for Melon Magic (watermelon, mint and lemon) and Green Dream (kale, cucumber, raspberry, mint, apple, ginger, kiwi), donated by Huriyali and freshly brewed coffee by Classic Coffee, paired with healthy bites. Because we believe in balance, we mixed our juice with champagne and mingled a bit. 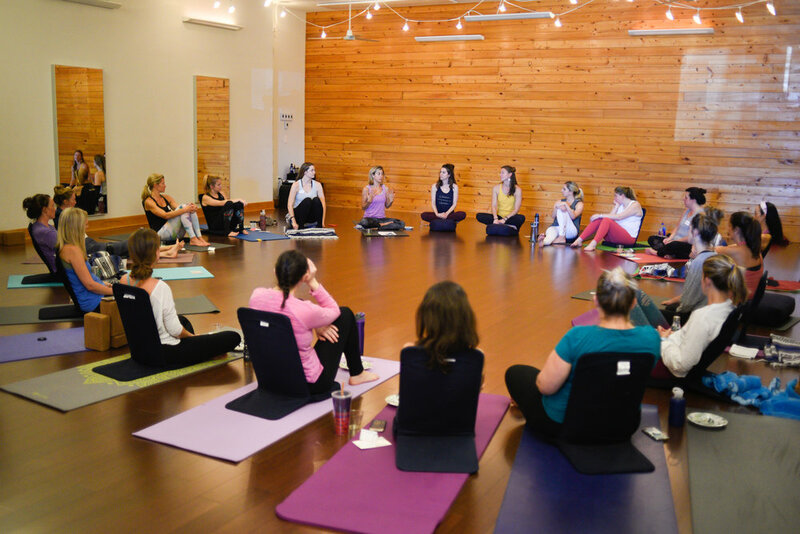 Soon the room was buzzing as women were encouraged to introduce themselves to each other and chatted for 15 minutes as we all moved our mats to form one tight circle in preparation for part 2. Going around the circle, I asked each woman what she came for. “Connection, a break, and inspiration” were the most common answers. Then we began the Honest Conversation with panelists and business partners, Jennifer Mitchell and Amanda Cunningham, owners of Soul Yoga. We talked about the concept of “having it all,” and how sometimes abundance shows up in forms besides money—dream homes, business opportunities, happiness, friends. Both panelists shared how their idea of balance always involves moving off center. Losing yourself to find yourself. Saying yes to other people over oneself too many times in a row and then BAM - suddenly you’re overextended, half a bottle deep and aware you are way out of alignment and have another chance to come back to center. A life practice that mirrors a meditation practice, for example. We stayed on that topic a while—hitting our limit. Falling apart. Judging the mess. Mamas in the circle shared their experiences of reaching the burning out point and, at the society’s request, the panel shared self-care tips for mind, body and soul. It was a special morning carved out for us as women outside of our roles in society, and such a different vibe from our nighttime Champagne Society events (and equally rewarding!). Thank you again to our sponsors, Huriyali and Classic Coffee, for being part of our very first SWEAT event. 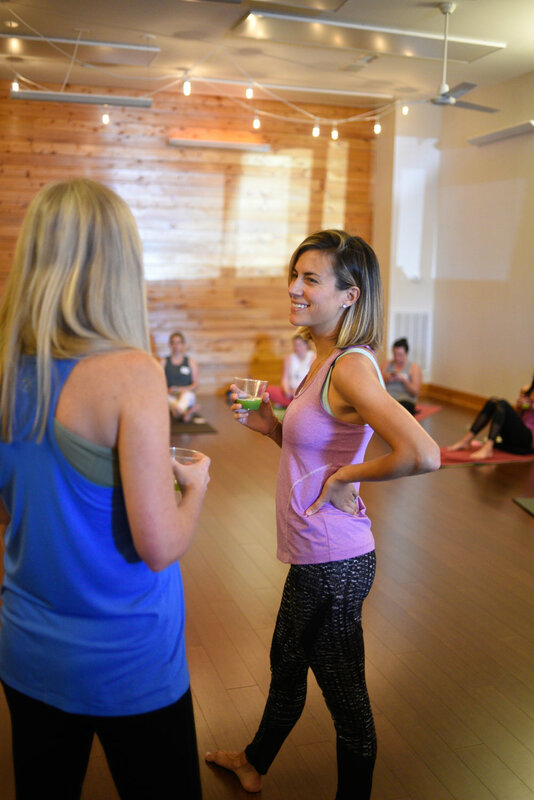 To stay in the loop for our next SWEAT event, make sure you’re on The Champagne Society Insiders Email List, and you’ll be notified when new dates are released and tickets go on sale.